My last semester as a senior undergrad student at Tarleton State University I had the opportunity to help with a research project on water sanitation for Gondar, Africa. The goal was to come up with a long term solution to sanitize the water with a water filter. Now with the horrific Ebola disease spreading across Africa, I was reminded of my time doing two different research projects and traveling to the country once. I learned a great deal about Africa and it’s culture and I am saddened deeply by the problems the people face. I hope somehow I made a small difference over there by contributing to a water filter system, but the doctors & missionary workers have done and are doing so much more. To fully understand how people in Africa live, you have to see it in person. My reflection on learning while in college. One of the major ways that research classes provided was a valuable learning experience focusing on poor people. Some of my courses have helped me understand global issues. Such as my environmental science course contributed a broad spectrum of our global environmental problems – such as hunger, water exhaustion, and climate change causing global warming. I was scared sick by the time I finished this class, and I was sure we were going to be doomed within the next year. The geography class was an additional eye opener to learn about people and different cultures in other parts of the world. It gave me an understanding of why we have such a diverse mixture of religion. All of these classes of contributed to my research – because I knew how to combine all the information I’ve learned to understand the tribulations people face day to day here locally and abroad. Geography was not on my undergrad degree plan, but I begged my adviser to let me take the class anyway.. 😉 I was determined to learn about different countries, since I knew nothing coming from an Amish community. Taking college courses has helped me get to know myself better. It has taught me skills I will take with me wherever I may go in life. In July of 2011, I had the opportunity to travel to Namibia Africa and got a look at the culture personally. Even though I felt sorry for the people in Namibia, I couldn’t help but notice that the level of depression these people have is not known by the average American because its hidden by smiles, laughter and children playing in the warm sun. It was an awesome experience and redefined my respect for the many blessings I have and continue to receive. We’ve all been raised in different cultures, ethnic groups, and regions with differing belief systems. But going to college and learning different subjects lets us all connect in some way. The potential to actually experience first hand many of the things I learned about in different classes and by reading books and articles was very beneficial, both for aiding in remembering what I was learning, and so that I could see the way in which these theories had been applied in a real-world circumstances. I grew up as an Amish person and to be honest – Amish people are naïve and have negative views about the outside world. After I left the Amish, I would sometimes make snap judgments about people without taking the time to consider what’s happening in their lives. I would see a homeless person begging for money and assume the worse – lazy, dysfunctional, dangerous, and probably even thought of less flattering terms. But I really didn’t know peoples unique circumstances, whether he/she has a mental illness or severe emotional trauma – I just didn’t know. After I started college and went to Africa for a class research trip, I realized that judgments will always keep me feeling distanced from others, it will always keep me from being the compassionate person I knew I was. So I made a point of feeling sympathetic for those I didn’t understand, not only in other countries, but here locally as well. I started by trying to understand people in a new way. Just because I was taught that the outside world was rough and horrible didn’t mean I shouldn’t give people a chance. It’s hard to know who to trust and how much you really should help a person out if they don’t help themselves, but it’s all about being comfortable in your own skin and going with gut instincts. 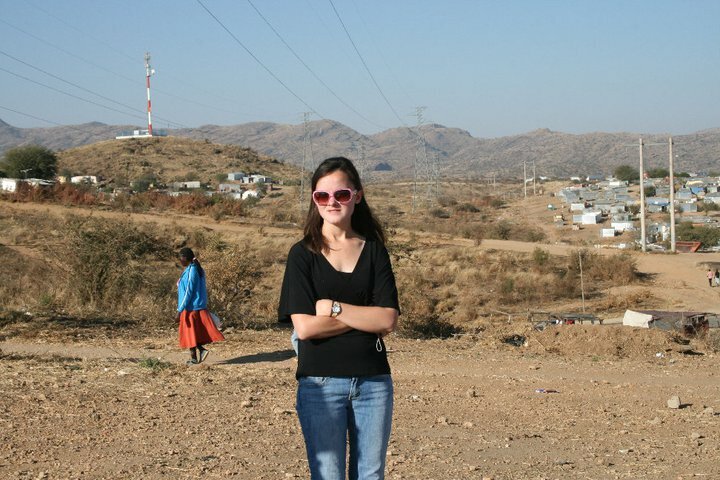 During my visit to Africa, I went to see a township outside the city of Namibia, and there is no picture that could have prepared me for what I saw. Corregated metal shacks as far as the eye could see. People were starving from hunger, missing shoes, improper clothing, drinking dirty water and sleeping on dirt ground where insects crawl. Therefore, causing tons of health problems. There’s no wonder why the Ebola outbreak started. Thousands of people walk hundreds of miles to get medical treatments. My global awareness opportunity has made me desire to continue in personal growth and self-reliance, as well as to provide new perspectives for the people surrounding me in our own culture and environment. Please keep the Africans and doctors and missionaries in your prayers. Give someone a hug today and tell everyone you love them, because you truly are blessed to live in the United States of America! Emma, you are truly a wise young woman. Even more so considering the first 18 years of your life were truly sheltered by your family’s beliefs and your isolation from things outside your community. You have traveled a path most cannot imagine, but have done so with grace and the desire to learn from every experience. You are truly an amazing young woman I feel honored to know. Nancy said it very well. Your blog tells just how dedicated you are in your work. Keep on learning. them is too expensive. It is better to own them.